The past few days we have been getting bombarded by snow. Not DC/Virginia/NYC snow - but a good foot or so of nice, wet, packing snow. 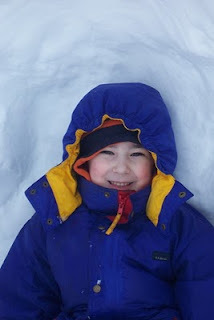 With some milder temperatures today, no wind to speak of, and a house full of HEALTHY people for a change - it was the perfect recipe for some fun in the snow. First we got all suited up - thanks to some great hand me downs from Uncle Bill and family, and a wonderful polar fleece from Disney, the Munchkin was nice and warm. 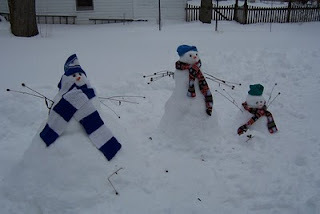 The first order of business was building a snow family. Matt was busy snowblowing the driveway - which was a daunting task due to the drifting, and the sidewalk plow, and the snowplow residue at the end of the driveway - so the Munchkin and I picked a spot on the opposite side of the house, within view of the dining room windows, to build our family. 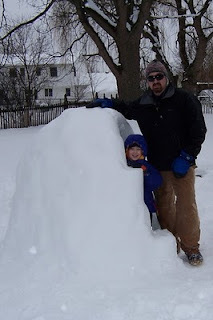 The one on the left is Daddy - constructed the old fashioned way by packing the snow into a pile and building up and up and up. Very tiring as the snow is very heavy and wet. We soon got smart and grabbed some buckets to build Mommy - in the middle. 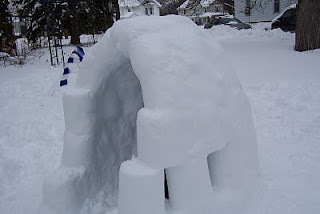 A packed bucket of snow, then some packed on the outside for rounding and shape, and then another sized bucket and a smaller one - this went together so quick. Two buckets combined made the Munchkin - and a few handfuls made Snow Maggie (on the ground in front of the Munchkin). Carrot noses, black eyed susan seed pod eyes and a few carrots rounded out these characters - no handy branches for arms so we used stalks of black eyed susan's... the birds will be happy! The Perfect Storm -all the way around!!! This is by far my favorite pie... and when we went on our shop hop last month we had every intention of stopping for some on the way home. We just ran out of steam (and were too full from awesome chinese food to eat another bite). 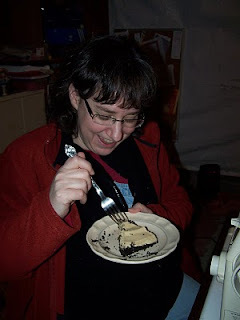 The last time I managed to have some was on my venture to Ohio for the quilt retreat last April. It's been too long! We really did sew - after a quick run to McDonald's and a Shamrock Shake (thanks to an old high school buddy putting the idea in my head - had not had one of those in AGES!)... and a slight interruption for a conference call with Jill. we were working on the Sunny Lanes pattern by Pat Speth, which Jill has already made and won a ribbon for at a quilt show!!! I have loved this quilt since I first saw hers on her design wall many many blog posts ago. And then I saw it in person and loved it even more. So when I Shellie suggested we do a quilt together - this was at the very very tip top of my list. Luckily for me she likes the pattern, too. Shellie and I have each cut the pattern out in our own fabric choices, and are sewing them concurrently. 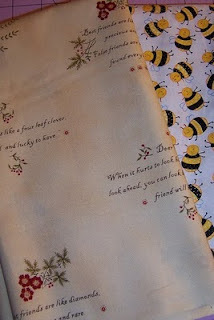 I am using the remainder of the Wonderland fabric I used to make Jill's quilt. Tonight I believe was the inaugural use of Shellie's sewing room for group sewing. Works nice -we can see each other and chat and each have a nice area for working in. And her little dog Mia (look on the floor in front of the white sewing table) is such a cutie pie - she kept an eye on us and chased away any spiders that were lurking! Good girl!!! There is more to go on this project -I think we are going to do the four patches on our own this week and finish up this step, then get together again to do the half-square-triangles that make up the other part of each block. 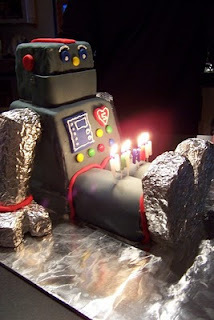 This is how we do birthday cakes around our house. One very tired, very happy boy got tucked into bed tonight, clutching his new chameleon "buddy" from Gramma and talking about his great day, even as he drifted off to sleep. His actual birthday is tomorrow -special snack at preschool and seeing all his friends after being off for the winter break. I think tomorrow night we will be lucky if he makes it home before falling asleep! Happy Birthday, Munchkin! I can't believe you're FIVE!!! They've just debut a bunch of free video project tutorials -and as a celebration they are having a sewing machine giveaway. This might be my chance to finally enter the world of machine embroidery? Anyway -looks like fun -and with a bit of birthday luck, you never know. ...well, before we get to that - let me tell you what our winner will be receiving. In honor of "birth month" - and in order to better celebrate birthdays in their own home, our winner will receive a birthday candle basket and a birthday cupcake pillowcase. To better keep track of birthdays - or other important little things -a little pocket journal is included. 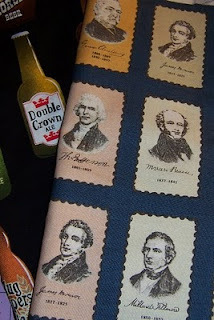 And - in honor of President's Day & Abraham Lincoln (Happy Birthday Abe), I've made a little pouch out of presidential portrait fabric. ...and now on to our announcement. 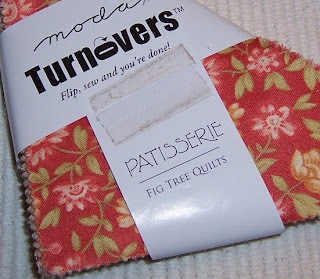 GTM - known in our Tran-Quilt-Ity group as greentechmama - or Ephi. 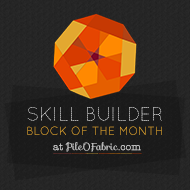 Ephi does not have a blog (yet?) but I've seen picture of some of her beautiful quilt work. Congratulations Ephi - I will try to get the package out to you this weekend. Thanks everyone for celebrating with us during Birth Month! We are having great fun! Being short - February just seems to zing right by - although I am sure those buried under feet of snow will disagree with me this year! Being in a normally snowy area that has not really gotten that much snow this season, it is strange to be reading of blizzards elsewhere and have nothing here but a low covering on the ground and mostly dry roads. NOTE - this is NOT a complaint -just an observation!!!! We are over 1/3 through the month -and the Giveaway deadline is TOMORROW!!! Be sure to comment on the giveaway post for a chance at the "big" prizes!! LOL! 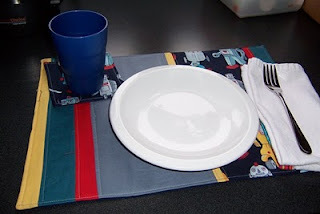 Tonight's gifty was a handmade one for the Munchkin - a robot placemat and coaster in preparation for his robot themed birthday party. 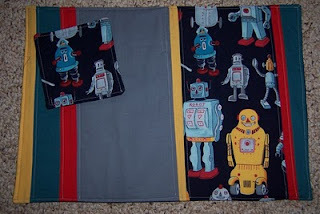 The robot fabric was one I picked up over the weekend during my shop hop with Shellie. 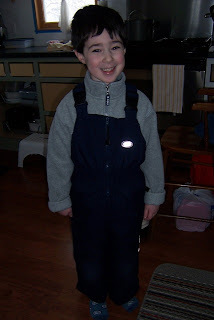 The overall effect was cool - kind of retro like the robots - and very masculine. He LOVES it - which is the best effect of all! It's a tiny bit smaller than I would have liked, and a bit wonky -but it fits his plate, coaster and cup with no problem so I guess we are good. One other little gifty I made this month was not for Birth Month, but for my sister-in-law, who was a bit under the weather and in need of a heating pad. 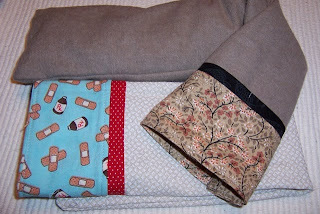 I love love love my rice bags for nice moist heat on sore spots, so I put one together for her -complete with two removable covers -one flannel and one straight cotton. 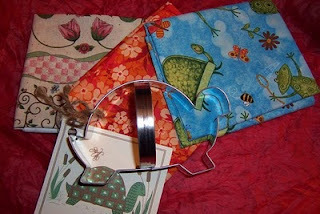 Each has a little flange and cuff just like the big pillowcases I make - for a bit of fun and extra comfort. Hopefully they won't get too much use - but now she has them when she needs them. I am not good at waiting - never have been. When it is time to go somewhere, I tend to be ready to leave early, and get antsy while waiting to leave. I am better once I am there -even if I have to wait there - but I am happiest when there is little to no waiting involved. Pre-Christmas I try to keep myself busy so I don't go crazy waiting. Pre-birthday is easier now with "Birth Month"... but still is a long wait from February 1. So why oh why did I think signing up for a Valentine's Day swap with my friends in TranQuiltIty would be any easier? I am haunting the Post Office as much as The Munchkin, who has suddenly gotten impatient for his February issue of Your Big Backyard. Luckily for me - some friends stepped into the gap while I waited. Good thing she loves turtles as much as I do - and bumblebees - and orange! These are YUMMY fabrics!!! The picture just does not do them justice. And then - to make waiting even more bearable - Shellie and I decided we were due for a shop hop. I needed to bring Zoe in for her annual checkup, and figured it would be a good time to introduce Shellie the shop next door. And then Shellie wanted to take me to three other quilt shops - one that I had been to about 8 years ago, and 2 others that I had never been to. Add in a wonderful chinese food lunch - and a run through Target - and we had an AWESOME day. We are just far enough north that the big east coast "blizzard" (SnOMG is my favorite tag for that storm) did not affect us - and we were moving into stores quickly enough that the cold temps were not that bad. We got to meet up with a fellow TranQuiltIty member, Maureen, and a 25Weeks member, Linda. And one more FQ, which shall remain hidden until further notice because it's purpose is too obvious and I need it to be a surprise. 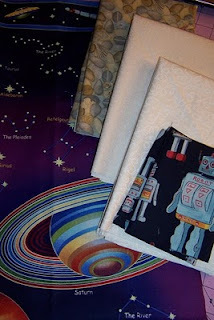 I am not going to try to explain what all these are for - I will just refer back to this post once I have the finished project ready to go - either for me or for some special recipients i had in mind when I saw these fabrics. 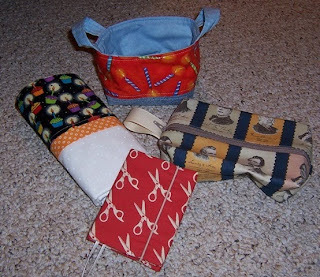 One last little thing - I made these fun little pockets while "waiting" - and the tutorial for them is here. 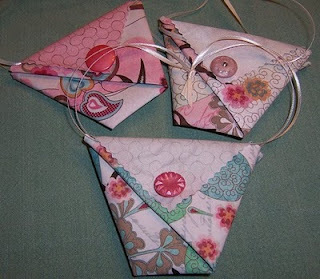 Quick, easy, could be no sewing involved depending on your approach - and great little gifties for Valentine's Day - or any special day depending on your fabric of choice. 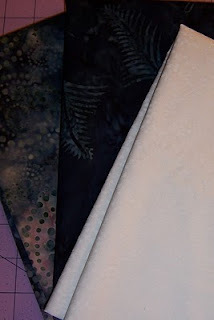 Well, I went and did it - I started a new quilt tonight. If you were faced with a bin of 2" scrappy squares, what would YOU do??? I've been pondering this quilt for a while... on and off since 2002 in fact... when I cut it out of the American Patchwork and Quilting magazine and stuck it in a binder. The pattern is called "Confetti." I looked for it online to see if it had been sold separately from the magazine, but I could not find it. 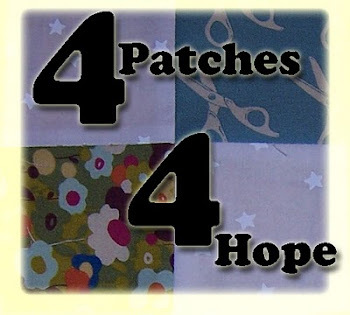 But try to picture four patches with rectangular white sashing and setting squares between them - got it??? To make the size described in the pattern - which is 81 x 92, I need 1079 2" squares. All different colors- no whites or creams, as those come into play in the sashing. I wasn't sure how many squares I had already cut out in my shoebox, since I have been trying to trim scraps as I generate them, so I decided to just start sewing... and figured if I ran out of scraps now, I am sure more will come along eventually, so this could be an ongoing project. It may not be as ongoing as I thought/feared. As of right now, I have 470 of 716 squares sewn into pairs. 235 of 358 pairs. In one evening. In one sitting. Brights, darks, pastels, holiday, novelty -you name it, it's in there. Pulled a pair and sewed them together - whatever I grab, that's how it goes. And the shoebox looks nearly as full as when I started!!! And I am over halfway there!!! Oh - and in case you are wondering why 716 and not 1076 in the pairs? The remainder go in the setting squares and the pieced border. So Birth Month has begun! Happy February everyone! Don't forget to enter the Birth Month giveaway by the end of the day on February 11th!!! The Munchkin got to open the first pocket last night - insisting on pulling over his step stool to reach it himself without any help. Since he is an "exceptional reader" (his words!) - I just wrote down on a slip of paper what his little Pocket Present was, and he pulled out the slip to read it. You can see that the pockets are not all that big, so most of the little gifties are done this way - or through cutting out little pictures of the object. The Munchkin has really taken his "gifting" responsibilities seriously, and worked with me to make up a whole list of what Daddy will find in his pockets. He very carefully wrote them out on paper, cut them all out, and has them all carefully folded up in the right pockets. (although Mommy had to move them around a bit to make sure the weekday appropriate items showed up on a weekday, and the ones better saved for a weekend were in the right spots). But the honor of being 1st went to the Munchkin - and he found a little car to add to his Thomas the Tank Engine Take Along play sets. It was very fitting timing - since the buildings, track, and all the engines and other machines had pretty much taken over the living room over the past few days. And tonight is Mommy's night to pull. I wonder what the boys will have come up with??? ?